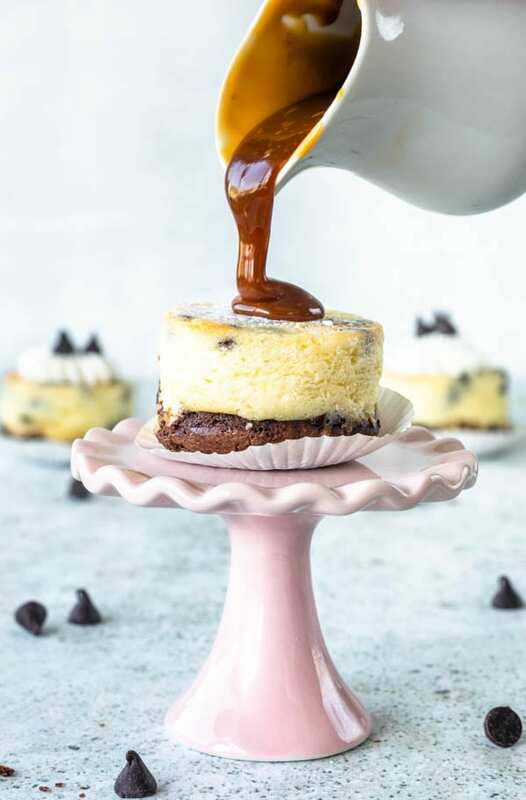 Cookie Dough Cheesecake Brownie Bites are my biggest indulgence right now. Throw a party. Call all your friends! Invite them to taste these bites! After all, you wouldn’t want to eat them all by yourself, would you? No judging, I’m just asking. Spread the love! Share your baking! Anyway, I am really digging this caramel pour, guys! I don’t know about you but it might be even better than the cheesecake itself. Actually, when I started to make this, I thought the cookie dough was going to be the best thing about this dessert. But yeah, turns out it’s the whole package! Speaking about the cookie dough, just a quick thing! I’m sure you are aware you aren’t really supposed to eat raw flour. So, if you make this cookie dough recipe for snacking purposes, make sure to bake the flour by itself before adding it to the dough. Just pre-heat the oven to 350F, spread flour on a baking sheet. Bake it for 5-10 minutes, just until heated through. If you are making this cookie dough recipe and aren’t planning on eating any of the cookie dough in it’s raw form, then you can skip the “toasting the flour” process. And that’s because your cookie dough will end up being baked in the cheesecake batter. But, seriously! Whatever you do, just make this! It’s not a very hard recipe. It has a lot of steps in it, but just a couple hours in the kitchen and you can have these amazing bites all for yourself!! 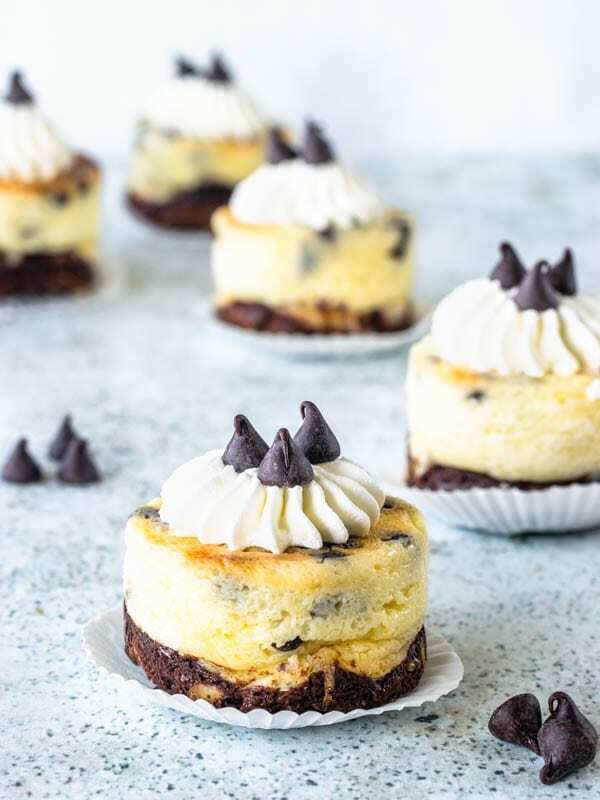 The creamy and tangy cheesecake, the cushy cookie dough balls, the rich and fudgy brownie layer. Brought up a level with the drizzle of sweet caramel sauce on top. I’m telling you, it can’t get much better than this! You can also leave the caramel sauce out, if that’s not your thing, or if you think it’s too messy and you want to bring this to a bake sale, or something. The bites will look like this. Still cute and delicious, right! 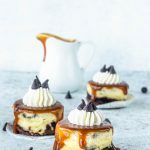 If you could draw the definition of the word indulgence with a pen, you’d probably draw something like these Cookie Dough Cheesecake Brownie Bites! Brownie, cookie dough cheesecake, caramel sauce, whipped cream and more chocolate chips on top. BOOM! 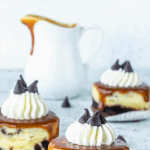 These are the best Cookie Dough Cheesecake Brownie Bites I’ve ever had. Now, you’re probably wondering how many cookie dough cheesecake brownie bites I actually had right?! As a matter of fact, it was the second time I made them. The first time was just an experiment and I baked it as bars, in a large 8×8” pan. And you could still do that if you want to! Just make all of the steps of the recipe and instead of baking it in cupcake tins, you can layer everything in a 8×8” pan instead. I actually didn’t even use a cupcake tin. I used a silicon mold that has perfect cylindrical cavities. Check it out here (and this costed me like $0.99 cents on amazon!! That’s right! It took a while to get to my house, but that’s how much I paid when I purchased it!) 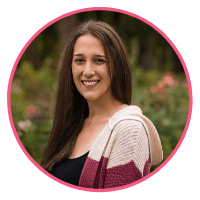 Also, this is an affiliate link, which means if you purchase it, I receive a small amount of money from Amazon, at no added cost to you, just for the fact that you were lead there through my website. So this recipe is very versatile! You can bake it in pretty much whatever you think would work! About more delicious bites! Try my Walnut Cardamom Pastries, or my Oreo Cupcakes, some of my most delicious bites ever! 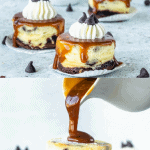 Cookie Dough Cheesecake Brownie Bites. Such a long name for such a simply amazing dessert! Brownie bottoms, Cookie Dough Cheesecake, Caramel Drizzle on top, then Whipped Cream, and some chocolate chips! Start by spreading the all-purpose flour on a baking sheet. Bake at 350F for about 5 minutes. You are just going to heat up the flour to make it safe to eat raw. And that’s really only if you’re going to eat this cookie dough by itself, because in our recipe from today, we actually bake the cookie dough in the cheesecake batter, so you can skip this step if you are not going to snack on the raw cookie dough balls. In the bowl of a stand mixer, cream butter for about 1 minute. Add brown sugar and cream for another minute. Add vanilla and milk, mix until combined. Add flour and stir until incorporated. At this point, I like to stick my cookie dough in the fridge for at least 30 minutes, to make it easier to roll the balls. I like to roll the balls a little smaller than a tablespoon size. Roll balls and refrigerate them until ready to use. In the microwave, or in a double boiler pan, melt butter and chocolate together. Once melted, add both sugars, granulated and brown. Whisk until incorporated. Add eggs, one at a time. Whisk to incorporate. Sift flour, salt, and cocoa powder into the bowl. Mix until incorporated. Cream cream cheese in the bowl of a stand mixer for about 2 minutes. Add sugar and cream for another 2 minutes, scraping the sides of the bowl in between. Finally, you can add the mini chocolate chips to the batter. Place sugar in a medium heavy bottomed saucepan. Melt sugar, stirring frequently, over medium heat. Once all sugar melts, stop mixing. Let sugar caramelize. It should become a deep amber color. Now, be very careful because caramel tends to burn in a second. One second is not burnt, and the next second, it’s toast! Keep your eye on it, and as soon as you see the deep color form, remove the pan from the heat. Add heavy cream at once, whisk to combine. Be careful because at this point, when you add the cream, mixture will bubble up and rise to the top, which is why you need a bigger saucepan than you think. Once caramel has been incorporated, add butter in. Bring back to medium heat, mix with a wooden spoon, non stop, until caramel thickens a bit, about 1 minute. Add vanilla extract in. Mix until combined. Store in the refrigerator for up to 20 days. Whip heavy cream until it reaches stiff peaks. My tips for a good whipped cream are: make sure your bowl and your whisk are cold. Stick them in the freezer for a few minutes before whipping the cream. Also make sure your whipped cream is very cold. Whip at a high speed. To bake, you can either use a 8x8" pan, cupcake tins, or other cake molds. I use this one right here, which are pretty much cupcake sizes, just a bit taller. And this recipe makes for 6 of them. If you are using a 8x8" pan, you can grease the pan lightly with some butter. Line it with parchment paper, and grease the parchment too. If using the muffin tins, you might want to use some cupcake liners. If not, simply grease them lightly with some butter. My silicon molds don't need any greasing. If you are using a silicon mold, don't bother greasing your pan. First, start with the Brownie Layer. Lay brownie batter, evenly, on the bottom of pans. On top of the Brownie Layer, spread the cream cheese mixture, evenly. Place cookie doughs in the batter. Push them down so they sink in. Bake for 10-30 minutes. The reason why the baking time range is so large, it's because it will depend a lot on what kind of pan you are using. Small cupcake tins will take less time. A large 8x8" cake pan will take longer. Remove cheesecake from the oven when the top seems set, and slightly golden. To remove the cheesecakes out of the silicon pans easier, I simply stick my pan in the freezer for 30 minutes before removing them. Pipe whipped cream on top. Place chocolate tips on top to decorate. THIS is everything I want for dessert in a small bite! It’s a 3 for one! Yummmm! 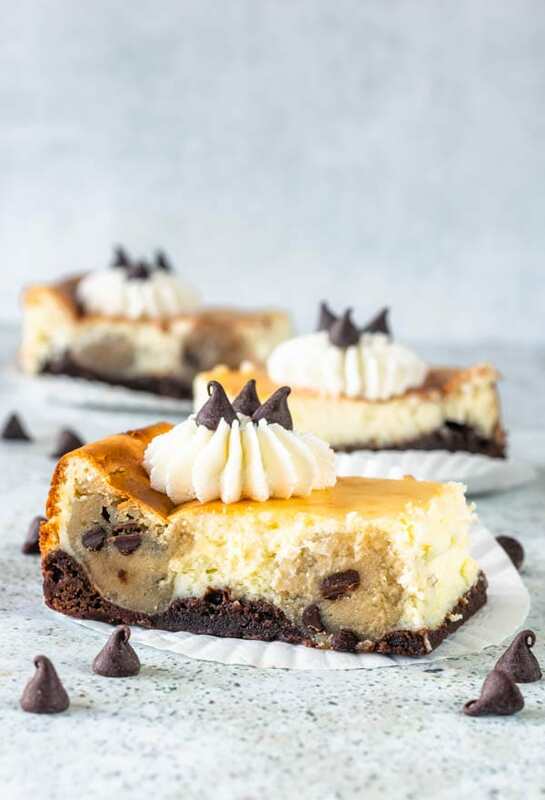 My son has been begging for a cookie dough dessert and I think I’ll make your cheesecake brownies this weekend ! ohhh that’s a great idea! Thanks Linda! 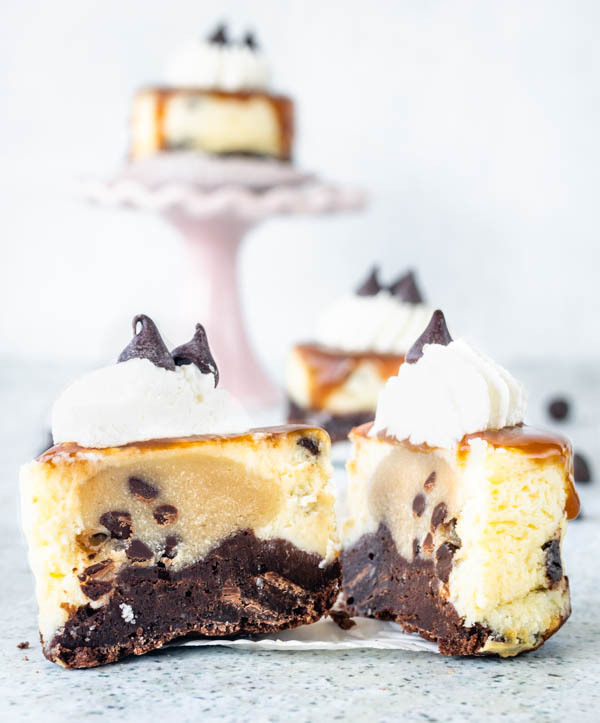 Hopefully your son will like the cookie dough cheesecake brownie bites!! 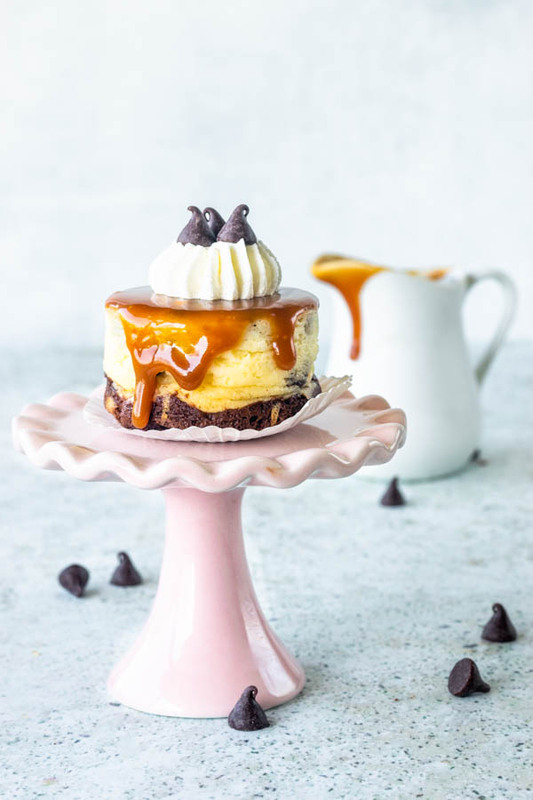 You had me at cheesecake…and that caramel sauce! This is cheesecake heaven! Oh, these look so delicious! I definitely wouldn’t stop at just one. Yum! You are right, that caramel pour is awesome! 🙂 I totally did not know that you weren’t supposed to eat raw flour! Thanks for the tip! These look so decadent. What a great idea. I bet my 5 year old would not stop eating them! Whoa… you’ve taken all the tastiest things in the world and put them together into one incredible dessert – love it! haha I was thinking, what are my favorite desserts? cheesecake check! cookie dough check! brownie check! caramel double check! lol thanks girl! Thank you for introducing me to my new addiction! Yum! these are over the top yummy looking. Whats even better is they re individual treats too. 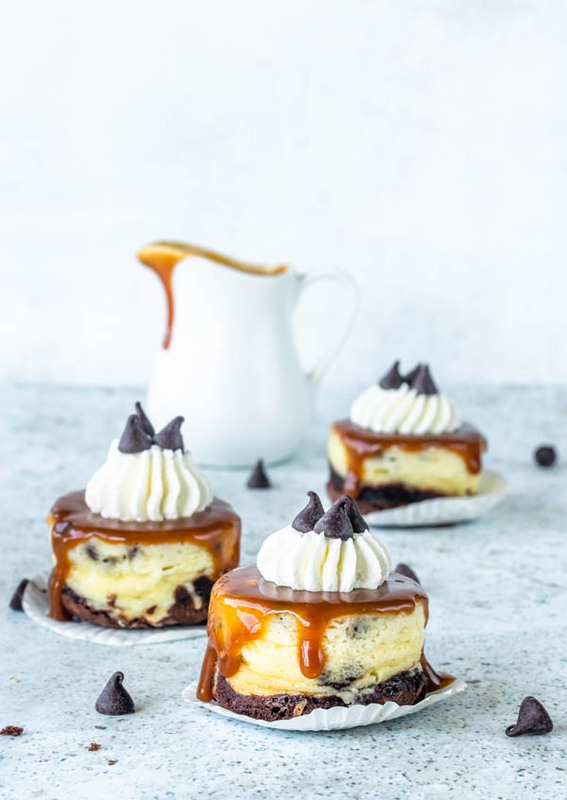 We all love cheesecake these will be a big hit! Thank you, I love cheesecake as well. It was a big hit at my house! I’ve never heard of a cookie dough dessert. I thought it was just the perk you got at the end of a baking session!